Definition at line 62 of file vm.h. Definition at line 87 of file vm.cc. 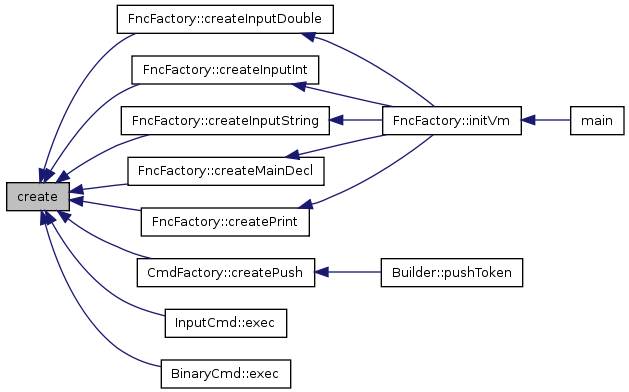 Referenced by FncFactory::createInputDouble(), FncFactory::createInputInt(), FncFactory::createInputString(), FncFactory::createMainDecl(), FncFactory::createPrint(), CmdFactory::createPush(), InputCmd::exec(), and BinaryCmd::exec(). Definition at line 93 of file vm.cc. Definition at line 100 of file vm.cc. Definition at line 107 of file vm.cc. Definition at line 114 of file vm.cc.